Few days back , i wrote about 10 ultimate ways to make Firefox perform blazing fast. That post involved tweaking of settings to be done by editing the advance settings configuration page of Firefox. The process can be very difficult for many novice users and those who doesnt want to play with deep settings of the browser or the operating system. For those people and many other users of Firefox including me, here,s a addon that does the working of improving the performance of the browser in just a single click. No more advance settings stuff. 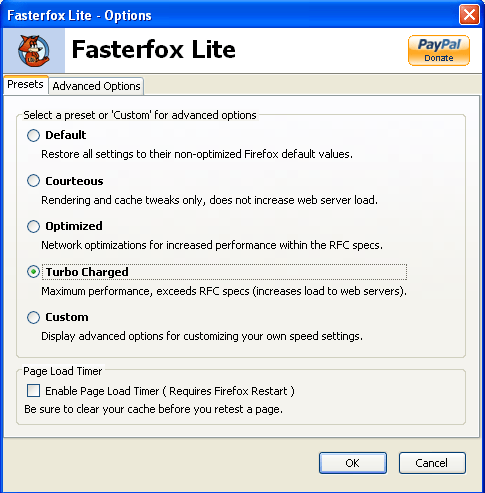 I am talking about Fasterfox Lite which does all the Performance and network tweaks for Firefox, without the Enhanced Prefetching making it perform much better and faster. 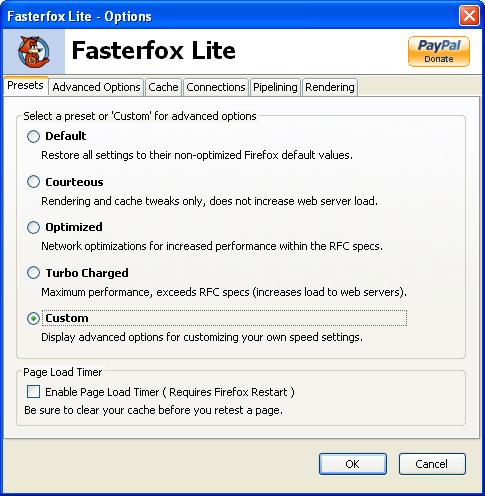 Fasterfox Lite allows you to easily tweak many network and rendering settings such as simultaneous connections, pipelining, cache and initial paint delay. Unique to this Lite version are included options for SSL Pipelining, timer-based content reflows, UI Responsiveness, Link Prefetching, IPv6 DNS lookups, and by default the Page Load Timer is disabled. If you want to manually change the “about:config” settings, then the Fasterfox Lite preset must first be saved to the “Custom” setting. This is to prevent the configurations from being different from a selected preset’s settings. The addon is categorised as a ” Experimental addon”. You need to tick that when you need to install it from the addon page. By default, Four options are provided i.e. Default, Courteous, Optimised and Turbocharged.Select anyone of these optionsÂ for yourself. By default, turbocharged option is ticked and it worked for me pretty well. If you are a bit of advanced user and not happy with the default settings, you can go for custom option to change options as per your need. If you choose custom, then you can play with options of cache , connections, pipelining and rendering. But its advised , change these options only when you know , what you are doing.